In eighth pAsuram, when asked “Did mArkaNdEya rishi not pray to rudhra and achieved his desire?”, AzhwAr says “There, rudhra was only doing purushakAram (recommendation). It was emperumAn who mercifully bestowed his desired goal”. Subsequently, AzhwAr explains “even for other dhEvathAs, emperumAn is the one who gives them the ability to fulfll the desires of those who pray to them”, through the example of rudhra fulfilling the desires of mArkaNdEya, through the mercy of ISvara (bhagavAn). Eighth pAsuram. When said “Though these principles are understood, mArkaNdEya et al got their desires fulfilled by approaching other dhEvathAs”, AzhwAr says “Would you like to hear, how that happened?”. rudhra, the benefactor, who is known as nagna, due to being dhigambara, during praLaya, rescued mArkaNdEya who is famously known through purANams and entered by servitude and seen him in front, and made mArkaNdEya a devotee of bhagavAn for his upliftment by the mercy of nArAyaNa; thus, while emperumAn who is greater than all, the natural cause and the great benefactor is standing in AzhwArthirunagari which has a protective layer of blossoming flowers with the complexion of a crane [white colour] and vast leaves, which other dhEvathA who is with expectation, are you speaking about? pukku adimaiyinAl – Entering with servitude. He did not enter as “the servitor of sarvESvara“; but entered as “the servitor of rudhra”. thannaik kaNda – He did not lose anything by not seeing rudhra as such. pukku … – Neither there is loss due to the target of surrender [rudhra]; nor there is any loss due to not seeing. 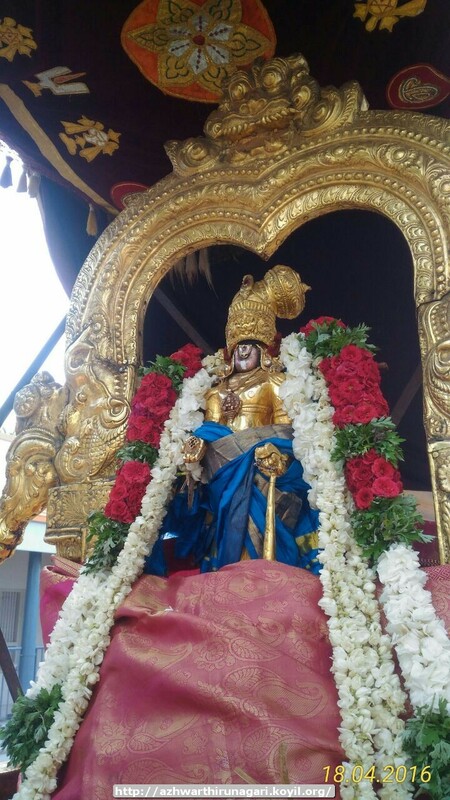 mArkaNdEyan avanai – one who is known as mArkaNdEya. nakka pirAn – nakkan means nagna. He is known as pirAn (benefactor) since he helps his followers and since he bestows knowledge. Since “nArAyaNa” is highlighted subsequently, it is said that rudhra pointed mArkaNdEya towards emperumAn‘s divine feet saying “when it comes to being a servitor, there is no distinction between you and me”. uyyak koNdadhu – rescued when in danger. nArAyaNan aruLE – rudhra said to mArkaNdEya “You served me for many days; that should not become useless. I also got this position by surrendering unto emperumAn. Now, feeding you means giving you advice on from where you can get food [i.e., desires fulfilled] [when a hungry person knocks on someone’s door and if he does not have food but is caring/courteous, he will direct the hungry person to the house where food is given]” and lead him to sarvESvaran. “aruL” (mercy) should be read as “aruLAlE” (by the mercy); also explained as – rudhra protected him by making him receive the mercy of emperumAn. kokkalar … – AzhwArthirunagari which is having flowers which are having the white complexion of crane and the vast leaves as a protective layer. This is the nature of the land [very pure and vast]. mikka Adhip pirAn niRka – While emperumAn who is greater than all and the cause of the universe is standing. mikka – Glorified greatly but having shortcomings while approached – unlike this. [Explained further] After accepting service for a long time, when it is time to bestow the goal, not having to lead to some one else [like rudhra had to do]. maRRaith theyvam viLambudhirE – You are highlighting one among the many prakArams (forms) as ISvara [bhagavAn]; oh losers! while nothing which is not his prakAra can even exist, you are highlighting such prakAra as prakAri (substratum – bhagavAn) and are looking nonsensical. viLAmbudhirE – AzhwAr feels that these dhEvathAs are not even qualified to be discussed about. This entry was posted in thiruvAimozhi, thiruvAimozhi 4th centum on May 5, 2017 by Sarathy Thothathri.